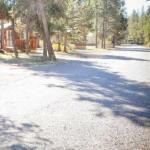 Situated in Sunriver in the Oregon region Bend-Sunriver Camping Resort Two-Bedroom Cabin 5 offers accommodation with free WiFi. The units come with parquet floors and feature a fully equipped kitchen with a microwave a dining area a flat-screen TV with satellite channels and a private bathroom with bath. A toaster and coffee machine are also available.